INDIAN HILL, Ohio – Sterling Snell won’t soon forget the win over Holy Cross Aug. 24. 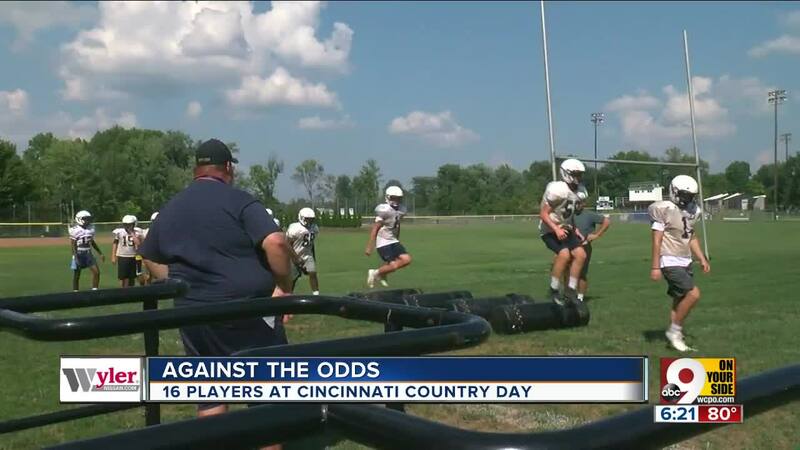 CCDS, a Division VI program, has just 16 players on its roster including two kickers. The Indians have three coaches. The odds are certainly stacked against them this season. But, it's a challenge they embrace with enthusiasm. CCDS took a significant step Aug. 24 when it defeated host Holy Cross 25-6. The previous coach, Matt Hanhold , left to become the Baldwin Wallace University linebackers and special teams coach July 20. Yet, the transition was smooth because Ross was the interim in 2016 and varsity assistant for Tim Dunn for 14 seasons. Holy Cross dressed 34 players and had 12 coaches on the sideline Aug. 24. “I think they’re going to remember that game for the rest of their life,” Ross said. Ross called a timeout early in the second quarter to calm the team’s nerves after trailing 6-0. But, CCDS quickly responded and rattled off 25 unanswered points. Junior Matthew Adkins had 145 yards rushing on 17 carries and four touchdowns. He had a 26-yard reception, two punt returns for 75 yards. He also had an interception and two forced fumbles on defense. Adkins is also a two-year starting point guard on the basketball team and a regional qualifier in two track events. “He is a phenomenal athlete with game-breaking speed and has the ability to take it to the house every time he touches the ball,” Ross said. CCDS (1-0), which plays host to Riverview East (0-1) Friday, starts seven freshmen or sophomores. The team has just two seniors this year. Ross knew his participation numbers would be low this summer because of a smaller senior class. But, it’s not uncharacteristic. Three years ago, CCDS went 10-0 in the regular season with 23 players.